Discuss the benefits of using aluminum as a lightweight, strong, noncorrosive cover for wastewater systems. List problems, such as odor and appearance, with uncovered wastewater in municipalities. Identify types of aluminum covers engineered for wastewater protection. Discuss installation methods for containing and covering difficult and challenging wastewater projects. Many communities and some industries have a wastewater odor problem that can affect the entire community. Wastewater is composed of pathogens, nutrients, solids, chemicals and water. Sludge, sewage and wastewater are full of life and it is by recycling, regenerating and cleaning wastewater that communities can continue to thrive. However, this process can be accompanied by both strong odors and the sight of unpleasant lagoons of wastewater, process tanks and large facilities in the middle of growing neighborhoods. The engineering community is the first to be contacted to solve these problems for diagnosis and treatment. From odor studies to evaluations of the waste stream, the cleaning of wastewater is a process that must be managed carefully. From large cities to county seats in suburbia, planning an efficient strategy for solving this problem may include covering the problem with graceful arches, domes and flat vaults made of strong, lightweight and sustainable aluminum. As discussed later in this article, the engineering and selection of the type of wastewater cover has implications for cost and efficiency for wastewater treatment. When developing a comprehensive approach to odor control at the Manchester, New Hampshire Water Pollution Control Facility, engineers reviewed a number of factors when designing the wastewater cover with a 130 foot span. Aluminum met the requirements for a material that could meet stringent snow loading requirements as well as having lower coefficients of thermal expansion than an alternative, such as fiberglass. According to Robert Gaudes, P.E. Senior Vice President at CDM Smith in Cambridge, Massachusetts, “The design choices for a structure this large were very limited. Flat or domed structures could have been used, but the domed covers create a much greater volume of air to remove and require much larger odor control systems. We weighed the cost balance of each type of aluminum design and decided that that although the flat covers were more expensive for the cover system itself, the odor control system was much smaller and much less expensive as there was much less air to treat.” Balancing the equations of cost, material and efficiency provides quality odor control for any municipality. Covering wastewater has several advantages. By covering and containing wastewater treatment the owner can improve air quality and neighborhood acceptance. Although design engineers and scientists may revel in the organic processes, the usual response by the general public is an objection to the appearance and smell of wastewater processes. Development of property near wastewater treatment plants is limited and property values can be lowered by the smells and appearance of these facilities. These odors are caused from the biological process that occurs in a typical wastewater treatment plant process. The common cause of the diffusion of odors from waste treatment plants are from gases emitted from organic and inorganic compounds. A toxic mix of chemicals and the decomposition of compounds and proteins, cause odors that in turn, cause complaints. Hydrogen sulfide is the main culprit for the particular “rotten egg” smell that will cause the phones to ring at city hall. 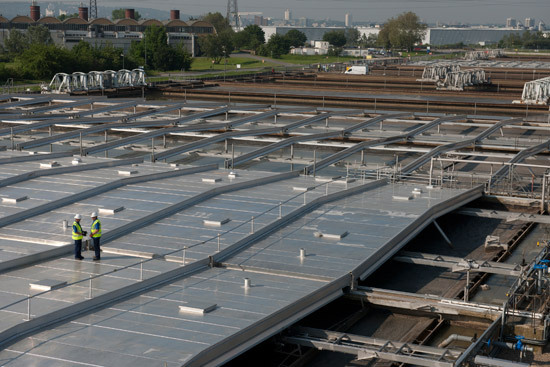 Efficient, low profile aluminum covers cap and contain the odor from one of Europe’s largest sewage treatment plants, in Beckton, UK, near London, England. Over six hundred thousand square feet of aluminum covers were installed at 20-foot intervals and designed to allow for the seamless operations of sewage equipment.